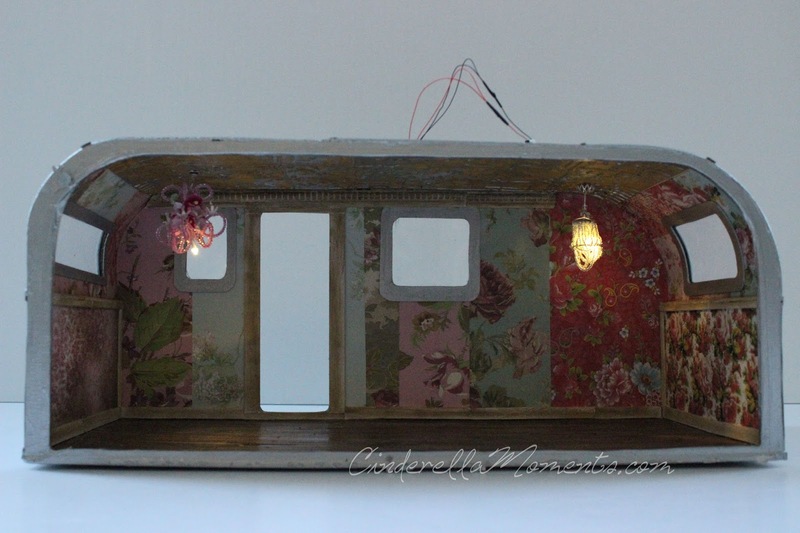 This is my second trailer dollhouse. The first one was with the Greenleaf kit. But for this commission I decided to make my own. It's about 7 3/4" x 7 3/4" x 18" long not counting the trailer pull at the front. 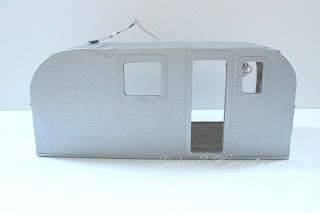 First, here are a couple of photos of the trailer right before I finished it. Here you can see the wires coming out of the top of the roof. The interior without any of the curtains. And here is the trailer finished. 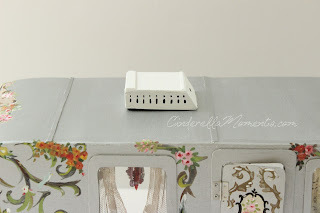 Under the air conditioner on top of the trailer, I have the battery and switch. The painting on the exterior is suppose to be very casual like doodling. It was tough to find the right bathtub. When I did the first one, I used a small loaf pan. They were really hard to find this time. I finally found some at HomeGoods for about $5-$6. There were 4 of them stuck on a rack. But they could be removed. The plumbing is done with thick wire. The front pull is not centered here. But that's just because I only had it there for the photo. I didn't want to glue it on for the shipping. Oh, I'm in love, I'm in love, I'm in love! 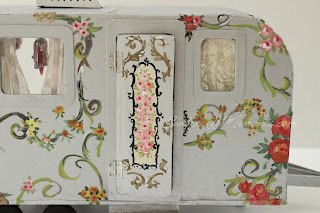 Fabulous floral doodling on the outside - brilliant loaf tin tub - love the retro shape of the trailer (or caravan this side of the pond!) - and the air-conditioning unit is such a brilliant touch. Going to make sure Cestina sees this! This is gorgeous! Amazing what you can do in such a small space! I love the idea of the exterior designs! Oh Caroline, another marvellous creation. 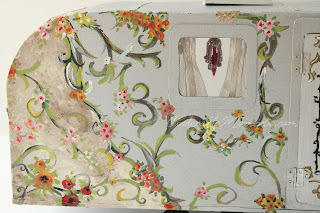 Although I love the inside - I think the painting on the outside is beautiful! Guau Caroline no tengo palabras, es una preciosidad. Totalmente gipsy, me encanta absolutamente todo. Un exterior totalmente inesperado pero genial, diferente . El interior encantador. Has sacado un gran partido al espacio. This is so darling! The painting on the outside is amazing, did you do that yourself? Love!!! Your mind works in such an incredible way...to use a loaf pan for a tub is just genius! Thank you so much for visiting my blog, I know it's a pain being private so I appreciate it very much:) I was so excited to read your house news, congratulations and you deserve every bit of goodness that comes your way:) Hugs! So cute. I went to a miniature's show last Saturday. 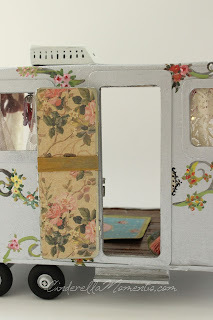 When my company leaves I will update the blog to post the photos of two trailers that I took there with you in mind. Keep up the good work. Wow!!!!! me encanta,es preciosa,la decoración exterior es tan imaginativa y colorida y la interior tan romántica,tienes un estilo propio,todo lleva tu sello y es un sello de elegancia y exclusividad!!! Hi Caroline! It's so great seeing what everyone in our miniature world has created during my long absence of the blog world ;)! This trailer (here we name it a caravan) is another piece of art from your talented hands. I absolutely love the doodling, it's gorgeous and it gives the caravan that wonderful, special 'Caroline'-look ;O!. 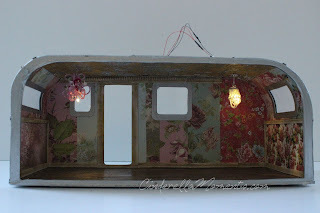 The interior has a bit of a gipsy trailer at first sight, nice work! Great find, this bath tub, it fits nice in this bathroom. This is an amazing creation from your skilled hands once again <3 I like the Magnolia living style soooo much, although it is so far in style from my Tasha Tudor cottage project. Wow Caroline I love your trailer it is amazing. The painting on the outside is stunning. I love the bathtub it looks perfect in your trailor. Another Fantastic masterpiece. Cestina has seen it and loves it! As usual, something you make is completely enchanting Caroline. 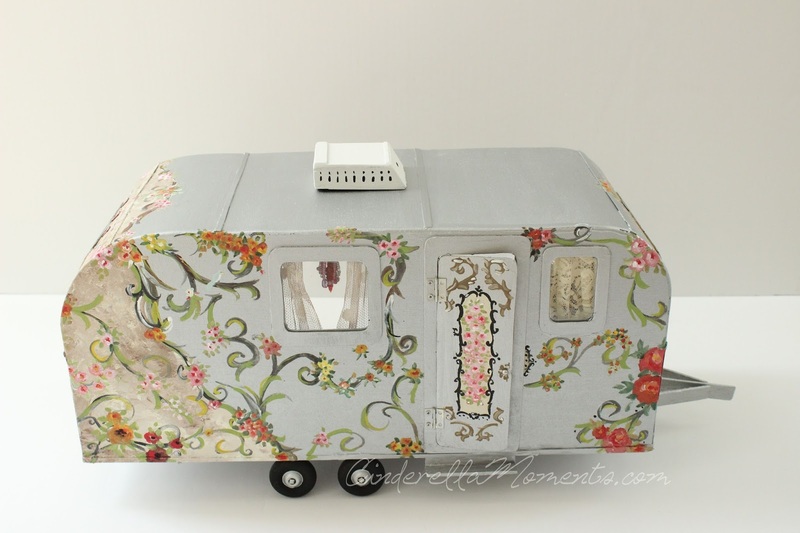 I didn't know Greenleaf made one, I wonder if Butterfly could give one her own inimitable touch...I feel Small Worlds is in need of a caravan! The way you decorated the outside is wonderful and goes so well with the inside. The colours and all the details inside are fabuluous. Absolutely gorgeous, so Magnolia Pearl :) The tiny loaf tin bath tub is a stroke of genius, I'll definitely be on the lookout for some of those as they could be just the thing for some little cottage bathrooms. Beautiful! I don't know how you figure out how to do so many things all on your own, but you are amazing! Do you happen to have a tutorial anywhere on how to make the kind of chandelier you have hanging in the bathroom? Hi Patricia! The chandelier is a jewelry end cap with filigree holes in it at the top. There's a ring in the middle. I use thin wire strung with beads to go from the end cap to the ring. Then I use thread to do the bottom swags. I hope this helps! Your travel trailer is amazing. I like the exterior painting, very original. And the interior is romantic. 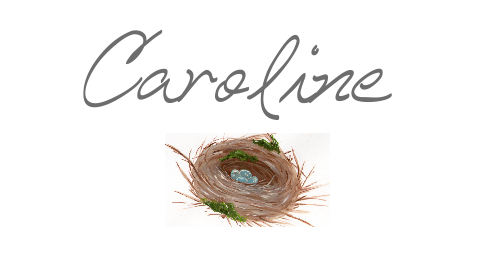 Really beautiful Caroline! The painting on the ourside looks so lovely I can imagine the lady of the trailer out there decorating her place amongst a mountain background! Lovely feminine style, always wonderful! 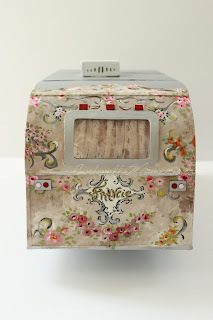 I love the painted vines on the exterior! They look very beautiful and intricate. The inside looks beautiful and luxurious. I think this will be a really fun trailer for some lucky doll to travel in! 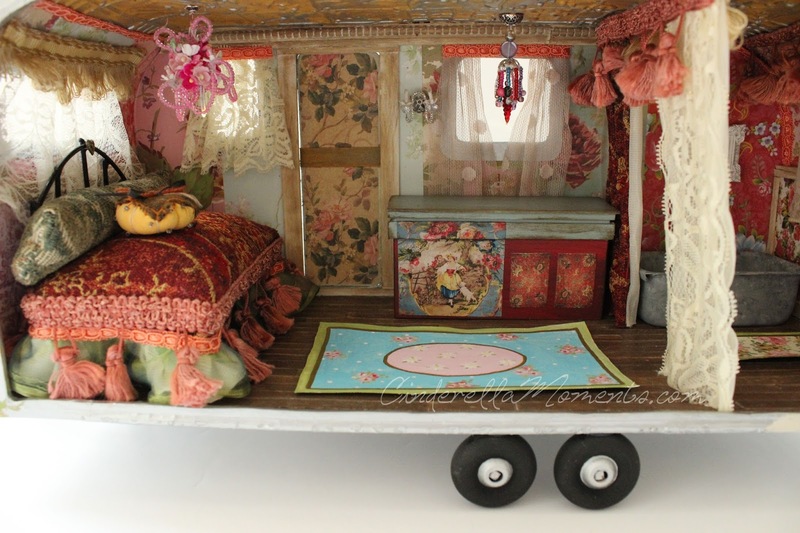 Blimey Caroline your trailer is astonishing!!! It is so freakin' AWESOME. Oh I love your little trailer! It has such style with the painted flowers on it. You're so talented Caroline. That tub is so cute! Hello again Caroline, I just bought a Greenleaf Mini travel trailer kit...I'm so excited to get started on it! 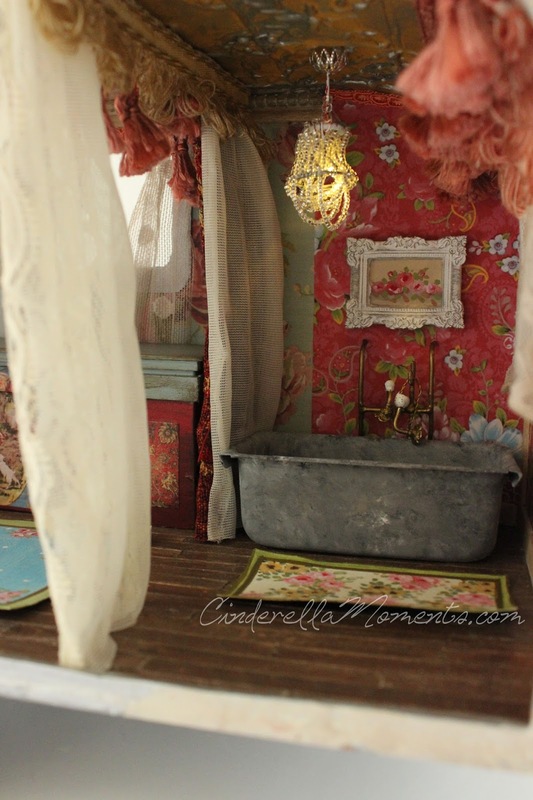 I think I may try to do the little bathroom like you did:) Love it! Me encanta, un laborioso trabajo en la pintura. Fantastic trailer! very very unique!!! 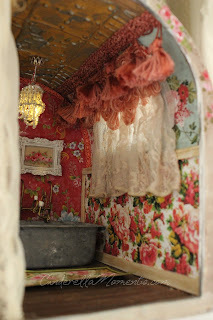 I would like to live in this sweet room and to bathe in the tub! I love the exterior painting. Stunning! I love all the details, I love this style and the color...I love so much! Great job Caroline, as always! ohhhh Me encanta!!!! I'm in love!!! It is a big job , paint , decoration , everything! Lovely! 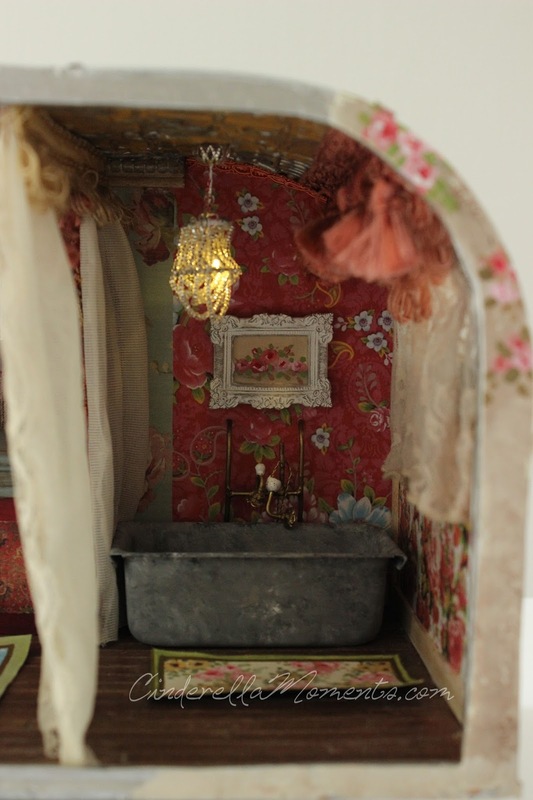 I have always wanted to make a dollhouse trailer, but you beat me to it! 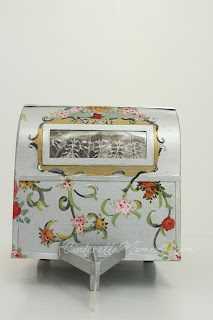 Love the vintage look with all your choices in papers and fabrics. Qué cosa tan bonita!!! Me encanta la pintura y los colores utilizados, un abrazo.